I didn’t know what a “nauratan” was, so I asked a friend who grew up in Delhi. Nauratan means "nine gems" and Indians usually spell the word “navratan” or “navrattan.” Navratan describes a piece of jewelry (a ring, pendant, bracelet or necklace) that incorporates nine auspicious stones. The nine sacred gems are arranged in a set order and represent planets in Vedic astrology. The gems and their arrangement bring the wearer astrological “balance” and good luck. On my friend’s navratan pendant shown below, a ruby (sun) is at the center, and around that stone are (starting at the top and going clockwise): diamond (Venus), pearl (moon), coral (Mars), hessonite/cinnamon stone (north lunar node), blue sapphire (Saturn/Shani), cat’s eye (south lunar node), yellow sapphire (Jupiter) and emerald (Mercury). In order for the navratan to “work,” all gemstones must be of the highest quality. The Jaïpur Bracelet bottle design (resembling a cuff-style metal bracelet) doesn't look like any navratan I can find in books or online; and the bottle does not aim for a true navratan composition (the Boucheron bottle has only one “stone” — a faux blue sapphire). Too bad Boucheron didn’t follow the lead of cooks (there’s navratan curry with nine special ingredients: fruit, nuts and vegetables) and use the “nine gems” approach to carefully highlight nine fragrance notes with connections to India or the auspicious gemstones of navratan jewelry. As it stands, the Boucheron-India connection is superficial — when it comes to perfume. Jaïpur Bracelet was developed by perfumer Carlos Benaïm and includes notes of bigarade, petitgrain, violet leaf, verbena, basil, hyacinth, carnation, lily of the valley, cypress, Cashmeran and iris (some lists include marigold). Jaïpur Bracelet begins with the scents of sweet petitgrain and violet leaf. Almost immediately, hard-candy “flowers” arrive; they are “shiny” and bright. In the rich, but somehow still “see-thru,” center of Jaïpur Bracelet, all floral notes merge into a well-blended, glistening “ray” of perfume. It’s as if hyacinth, carnation and lily of the valley have been genetically taken apart and then assembled into a strange, new flower. Jaïpur Bracelet’s floral-candy notes sour somewhat in the dry-down as citrus (and “berry”?) notes (acidic peel and juice) become apparent, and the high intensity of the opening notes diminishes — with “honey” replacing the glittery, crunchy sugar. As the fragrance enters its final phase it becomes a bit “talc-y” with citrus, musk and Cashmeran dominant (all blending to become a sunny amber accord). Jaïpur Bracelet has excellent lasting power and sillage (one spray was sufficient to scent me all day and that one spray outlasted a bath). Though the final phase of Jaïpur Bracelet reminds me of Jaïpur Homme, the fragrance is super-feminine to my nose: a high-wattage fruity-floral perfume. 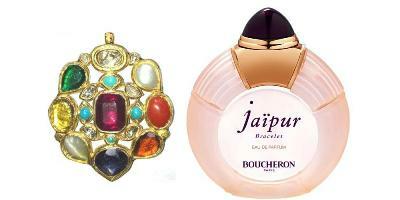 With Jaïpur Bracelet, Boucheron seems to be trying to attract a younger perfume customer. The fragrance does feel “youthful”…it certainly possesses no “mystery” — it “exposes” itself immediately. The sweetness and power of Jaïpur Bracelet make it ideal for cool weather or summery outdoor wear: a beach, with its sun and wind, would be a perfect place to wear it. If you don’t like unrelentingly sweet floral perfumes, don’t bother with Jaïpur Bracelet. Boucheron Jaïpur Bracelet is available in 50 and 100 ml Eau de Parfum ($106/136). 1. Boucheron’s perfume license went to Interparfums last year (2011), and all Boucheron fragrances except Jaïpur Homme, Boucheron Femme, and Boucheron Homme were discontinued. Other Interparfums brands are: Balmain, Burberry, S.T. Dupont, Jimmy Choo, Lanvin, Montblanc, Paul Smith and Van Cleef & Arpels. 2. First quote via Cosmetics International, 4/13/2012; second quote via Women's Wear Daily, 12/19/1998. Per the New York Times, 7/18/2012, "[Jaïpur Bracelet's] bottle is a soft pink, inspired by Jaipur’s nickname as the Pink City, and is in the shape of a nauratan bracelet, which is given to Rajasthani brides for good luck." I saw it at Winners in Toronto this week, if anyone in T.O. wants to save some money on it. kjanicki: it seems to have hit online discounters in the U.S. too. Maybe Boucheron was trying to appeal to people of (Asian) Indian heritage living in the US and Europe, which seems like a great idea. It sounds like the execution is a missed opportunity. Dilana: it does smell like a missed opportunity to me. But guess I should add that Indian consumers IN India may want to smell “Western” (like Jaipur Bracelet) the way we in the West want to smell like “India” — lots of spice, vetiver, jasmine, mango, etc. “Exotic’ for all sides…sells. Hadn’t heard of this launch at all. Friends have been chatting about the original Boucheron Femme as a favorite recently, though I don’t think I’ve tried it. I know I have some samples of Jaipur, but remember very little about it. As far as you know, does this “flanker” bear any similarity to it? That pendant is incredibly beautiful. The ruby at the center looks enormous. Thanks for sharing the photo. I’m also reminded of the dish called “navratan korma” (nine-gem curry). Hi, Joe: I don’t remember Jaipur smelling anything like Jaipur Bracelet…though it was fruity too (I believe with apricot). It’s so sad they discontinued it. You’ve reminded me I should grab a bottle! Alyssa: HA! You’re welcome. My friend is one serious jewelry buyer, I’d tell some stories but she’d aim her trident at me! From one reviewers I heard it is similar to Cerutti 1881, from other – to Dior Pure Poison. Could you please compare these fragrances? antonpan: sorry, I’m not familiar with Dior Pure Poison and have only tried Cer. 1881 once, long long ago. Maybe someone else can answer this question…. Shamefully… The Original Jaipur was Discontinued… AHHHH That Scent makes Me CRAZY!!! It is SO AMAZING! Seek It Out, I Beg of any o you reading this… It’s a “FRUITY” Floral with a heavy accent on Sharp Peach in the and then the Honeyed Lusciousness of Osmanthus…. Just GLORIOUS!!!!!!!!!! thenoseknows: drats…I should have tried to get a Jaipur sample so I could have compared it to Jaipur Bracelet…but when things “disappear” my attention goes elsewhere. HA! Fascinating post, Kevin, even if the perfume is not. If your friend has even more wonderful jewels, it sounds like the navrattan has indeed brought her good luck. I’m curious: does she pronounce navrattan/nauratan with a “u” or a “v”, or is it simply another language’s sound, poorly translated by the roman alphabet? Does anyone know of a perfume that would be a good replacement for Jaipur Saphir? It has been discontinued, and a very good friend’s mom was asking me if I had any ideas. I only smelled it on her only a couple of times so I don’t know it well enough. This sounds wildly different, I think Saphir was more of a sandalwood/spicy scent. Omega: remember to say “likED”…tis gone! Whenever I see your reviews I wonder before reading – and after – „does he ever LIKE anything?“ So I read this with apprehension as I quite like this one for a change. The original Jaipur was a favorite of mine and while this is nowhere close, it’s still a lovely fragrance. A colleague at work, who normally swims in Bvlgari Jasmin Noir, was persuaded by yours truly to wear the new Jaipur so i no longer have migraines on her account. It comes across as heavy on jasmine although jasmine is not listed. It’s worse than the old frags they did but miles better than Trouble, Miss Boucheron and other „young consumer“ nonsense. Not to mention brave when you see the drek that’s been thrown at the mass market. Yep. Brave together with the likes of Bottega Veneta.